If you want to nail edgy style, you need an edgy makeup look to go with your outfit. Here’s our complete guide to edgy makeup, with tutorials and tips. 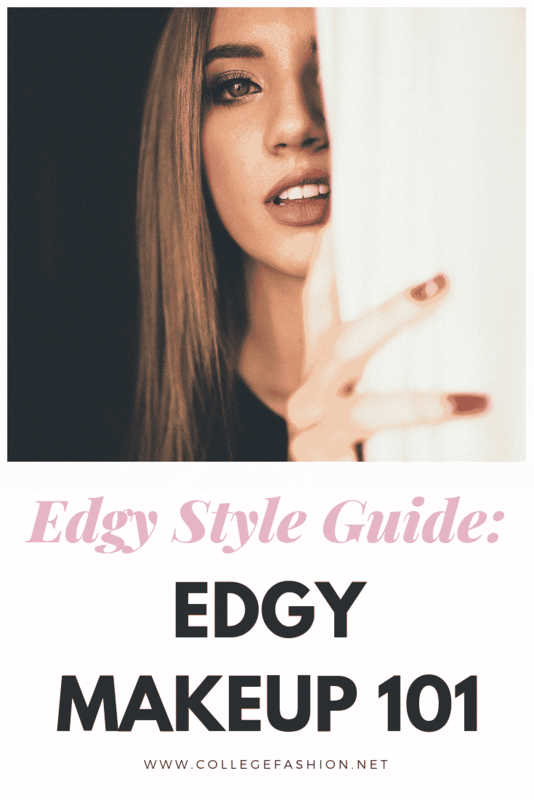 The past few weeks we have been talking about edgy style. We went over edgy outfits, edgy shoes, edgy accessories, and even edgy hairstyles. So what’s missing? Edgy makeup! Specifically, we’ll show you how to create the perfect makeup look to go with your edgy outfit. When it comes to edgy makeup, there are endless options. The classic look for the edgy girl is the smoky eye look, although that is only the beginning. Below are three edgy makeup styles, ranging from simple to difficult, that will be perfect to complete your edgy look. This is a timeless look that can be worn with edgy outfits but also other ones! The red lip makes for an instant confidence booster while the cat eye keeps it cool and feminine. The best part is, this makeup look is simple! Start with a neutral base, make a cat eye, and add the red lip and that’s it. Try this makeup look during the day or for a more relaxed event. Combined with a rocker girl hairstyle, it makes for a perfect edgy look. Nothing says edgy makeup like a good smoky eye. This smoky eye effect is done with lots of blending, which means you can make this look as dark or light as you want. For a darker look use more grey and black toned eye shadow, or for a lighter one, trying using silvers and light greys. To finish off the look, add black eyeliner to the top lid and along the waterline. Finish it off with a cat eye to give it that fierce edge! Since this look is pretty dramatic, it is perfect for a night out. Although you might think that the signature edgy makeup look is all about dark, black makeup, this addition of purple, orange, and gold glitter is a great way to incorporate some color into your look. Like the smoky eye look above, this look requires blending multiple colors in order to achieve the faded look. This would work best if you’re planning on going out but if you also like to wear heavier makeup during the day then it is a pretty versatile look! It would look great with a leather jacket and basic tee or a dress. What’s an edgy makeup look that you love wearing? Have any advice for those who aren’t makeup pros? Let us know in the comments! Makeup is the final step to any look. While it is not necessary to wear makeup unless you want to, it can be a great way to tie all of the separate pieces together to create the style that you are going for. With these three great makeup looks, you are sure to nail the edgy girl look! Tell us your edgy makeup secrets in the comments!